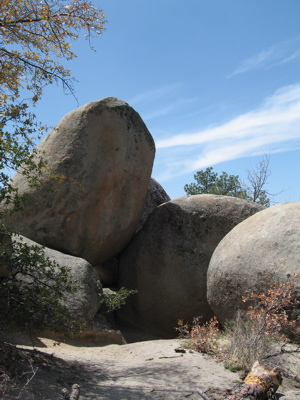 She clambered up the boulder in Groom Creek, berating herself for being out of breath. Maybe at the top she’d find clarity. She reached the apex, feeling the porous rock under her hands and appreciating it’s sharpened, pockmarked texture from thousands of years of elements and having once been under water. That she could respect; it some how soothed her. There was a time when she lived there, and though she hated the company she had kept, she could always be calmed by her surroundings. Deep sigh. Just another view. She’d seen beauty, landscapes, created dreams in her head that she lived in life, and each one lacked. She knew that it was due to her own failings in looks. Every dream had to begin with envisioning herself as attractive first, an extra step that stung each time. Everyone who lived the life she envied was pretty, plain and simple. Strength and confidence seems to attract the same. Those that she attracted were the weak and inherently flawed. She wanted maturity, initiative and certainty, something she hoped to have in herself, but wavered all too often. She became ambitious out of need, and resented it. Through years of hardships, “Be my pillar,” he had said. “Look how I fall, look how I’m so damaged by others that I must be cruel to you, only to forget when it suits me. Be my pillar because I need.” And as she stood like scaffolding for him, arms raised, stiff, floating away from herself and her dreams, motivated by necessity rather than desire, he turned. “Oh, look, I didn’t need you after all. Didn’t need any of it. I guess I was kidding.” And faded away. She couldn’t remember when she stopped loving him, but she knew it was before he’d come to this conclusion. Whether or not he loved her, it was not the passionate love of a spouse, but that of a child. And that, at 30 years old, was not something she could handle. But was it better to be alone, unloved in her shameful and permanent ugliness, than to be with someone who at least needed her in some sense? Where was that decision? Had she reached a point where she only wanted disposable companionship, having been used and tried to exhaustion? She was thankful there were no children to consider. Now there were sure to be none. So, another view. Another line of sight that went on forever. It was beauty, made her ache for things that were unreal. The rocks, the stillness, the trees that harbored streams and javelina, deer and sweet smelling earth. And the gentle pine needle covered ground that soften footfalls and emotions. And she’d seen it all before and had some how hoped this time it would be different. “I used to live here, you know. This one time I accidentally hit a javelina that ran out of the brush into the front of my truck. I stopped short; it shook its head, stood, and rammed the front of the Toyota, annoyed at my intrusion. It couldn’t have been more than 40 pounds, but it was tougher than me.” She said it softly and to no one, just sharing something that made her smile with the wind. She loved being alone and was never lonely. Her chest and throat hurt in the sunset as she turned, knowing that she’d continue looking for something she could not identify. It was the way she’d always been. And she had accepted it. This entry was posted in Art, Entertainment, Pop Culture, Stories, Uncategorized and tagged adult, arizona, childhood, family, fan, fiction, groom creek, heart break, love story, maturity, prescott, red dead redemption, short, west, youth.